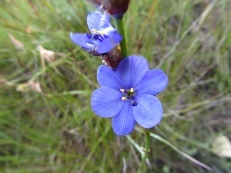 It is the smallest of the Aristea spp and has the same bright blue flowers as the others. It is a lily with its 6 petals. The whole plant is used. It is a superb antibiotic for pain and infection of the female organs. 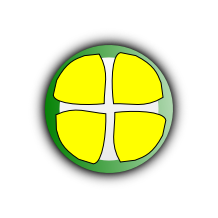 I have seen it work where the doctors antibiotics and other herbs I tried did not work. 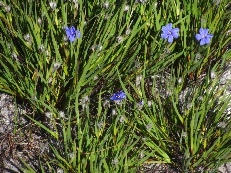 It grows where there is shallow soil that flows with water in winter in the mountains of the Western Cape. It produces lots of seed.